Twite Instruments designs and manufactures control systems for the industrial refrigeration industry. The main control system consists of TempScan that can control up to 100 rooms/cabinets 27 compressors and 12 condensers with up to 200 temperature inputs and up to 15 pressure inputs to control up to 5 systems/racks. Using SCADA software to control locally or remotely. TempScan model A-32 is a complete system controller that can control up to 100 rooms/cabinets, 27 compressors, 12 condensers and 5 liquid pumps in up to 5 systems/racks. Up to 200 temperatures can be monitored and data logged. CompScan model A-32-S can control any type of screw compressor available on the market. Inputs and outputs allow for digital or 4-20ma control and indications. MultiScan models TD-32-E and TD-32-ME are single room controllers that controls the liquid solenoid using a pulse valve in a DX system using the super heat of the evaporator to control the valve. Also model TD-32-ME can control a recip compressor and condenser. CompScan model A-32-R can control any type of reciprocating compressor available on the market. Up to 4 stages may be controlled. 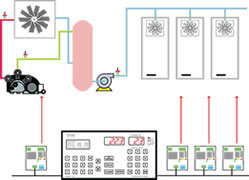 Condensers, standard & 3C/Dricon. .
TempScan SCADA software can provide computer control of all set points and data logging retrieval from the TempScan locally or remotely.